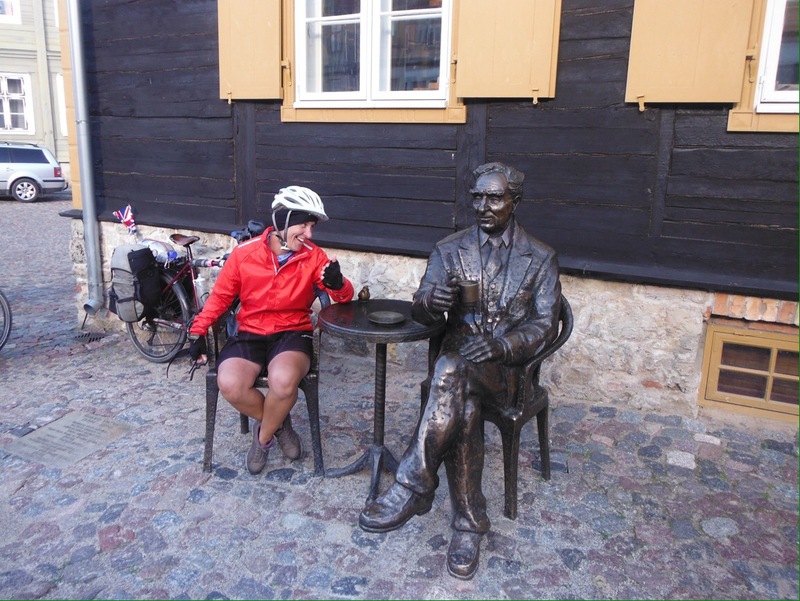 After our unplanned return from China and two months at home we were itching to get back on the road, so we had planned a final European loop to get us to Helsinki, from where we would ride home, completing the round the world cycle trip. It is now a few weeks since we pedalled away from Measham for the second time. As with our initial departure in September 2015 we were aiming for the Harwich-Hook of Holland ferry, and as the first time, we rode in glorious sunshine through beautiful English countryside. There really is no better place to ride when the sun shines. We mainly followed national cycle routes on small country lanes, though with a few more hills than our out of practice legs and lungs would have liked. 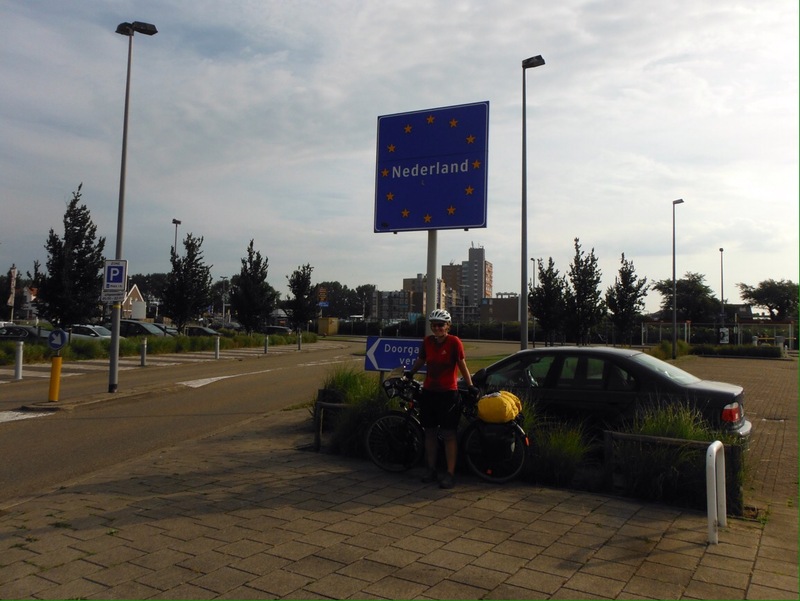 An overnight ferry (full of other cyclists, none of whom spoke to us – strange lot us Brits are) landed us in the Netherlands at 8am on Debs’ birthday. What better way to celebrate than to stock up on pastries at Lidl and head to the beach for a birthday breakfast. The sun was still shining, the wind was behind us and we were back on the best cycle paths in the world (not confirmed) surrounded by elderly Dutch cyclists on their upright bikes. The paths are almost totally flat, but can have a short steep(ish) incline and then drop at times. On one of these, one of our Dutch cycling friends warned us that “there is about another ten of these steep hills on this path ahead”… a Dutch steep hill that is. Two or three hard pedal strokes and you are up and over the peak. Rocky Mountains they are not. We were pleased to be back in Europe. A short ride to Dan Haag (we will be back…) and four trains later we were in the port of Travemunde on the north east coast of Germany, via Hamburg where we stayed with a friend for a couple of nights. The ferry from would take us to Leipaja in Latvia and we were mostly in the company of truck drivers. 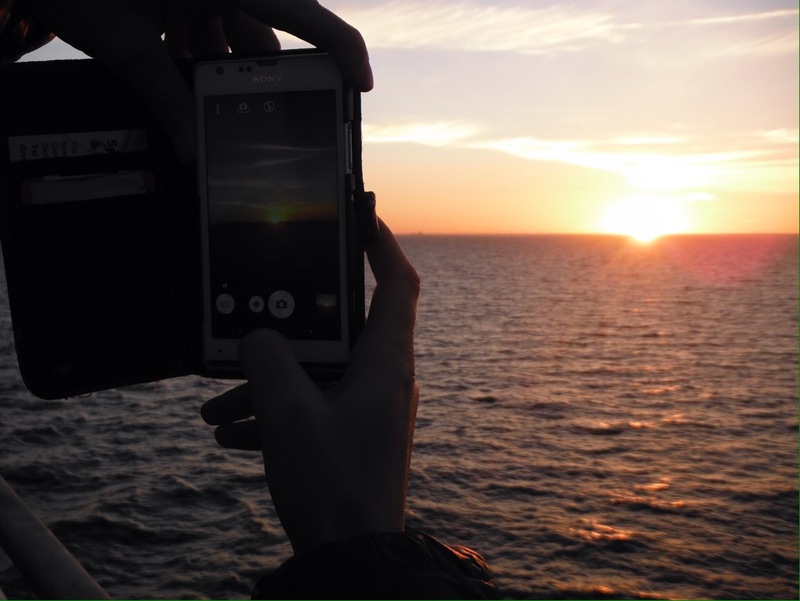 We settled in with a Lidl picnic and enjoyed the sunset from the boat. It was the smoothest sailing I have ever experienced. A mere 28 hours later we were in Latvia. As we arrived at 10pm I had booked a cheap hotel room to save us having to “ride around a strange town in the dark” looking for a place to stay. Rolling off the ferry at 10.15 pm, the sun was still above the horizon. We were five days from midsummer and the days were long. Ah well. The Sport Hotel was the bargain of the century at only €14 for the biggest room ever, with the answer to every British cyclists dreams, an electric kettle. There was even a sofa. 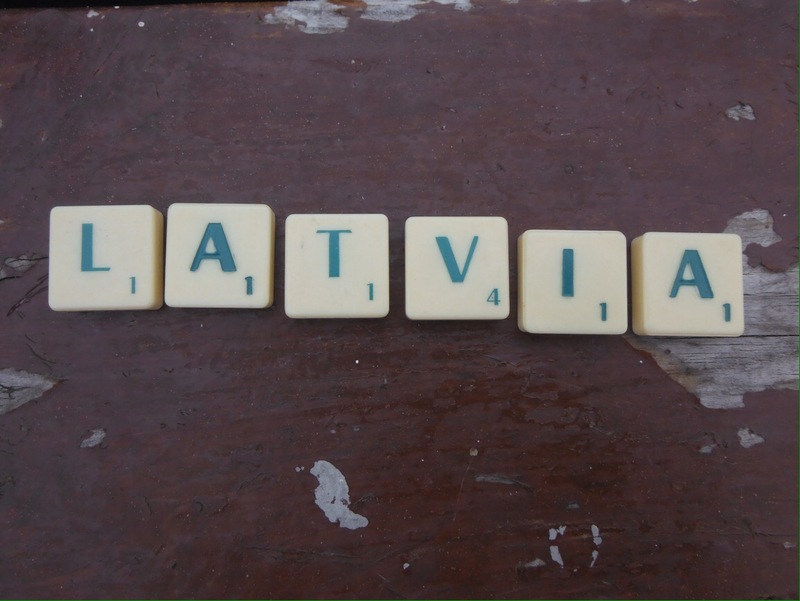 Welcome to Latvia. Shops were sometimes hard to spot. Few windows. The signs helped at this one. 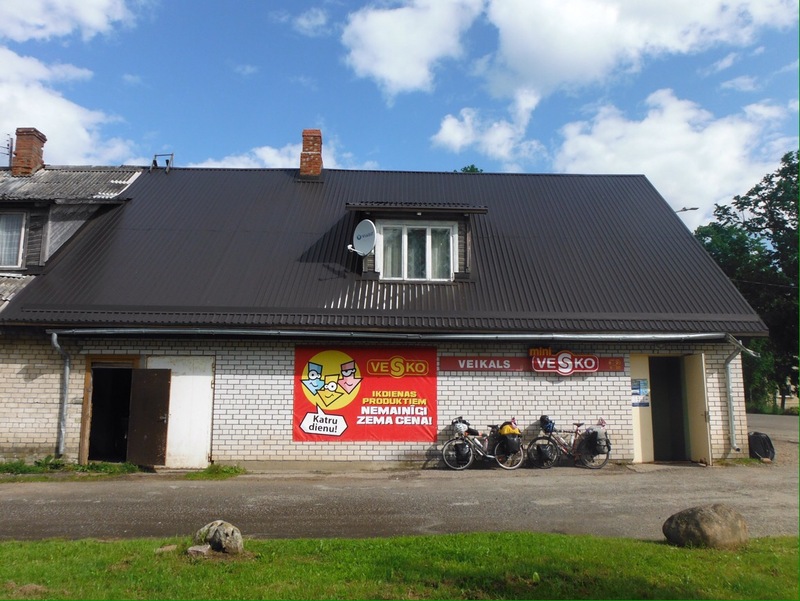 Finally we were back in the saddle, and set off the next morning with no idea what to expect from Latvia and no real plan, other than “ride to Estonia”. Riding up the coast seemed a good place to start, without realising we were apparently following a Eurovelo route (though we are a little sceptical of some of their “routes” that are often just someone’s nice idea) and before we’d even left town we saw five other touring cyclists. That’s more than we saw in the whole five months in Europe at the start of our trip. Cycling in the summer is more popular than the winter then. Leipaja had a few sights including a very shiny Russian Orthodox Cathedral and a soviet-era prison but soon we were on the open road and navigating by keeping the sea on our left. The sun was shining but our legs were weary from riding the loaded bikes for the first time in a couple of months. Ride all you like at home but nothing prepares you for carrying the weight of the bags. The first night in the tent since February was strange, it didn’t get properly dark at all so we had to use our buffs as a blindfold to give the illusion of night time. 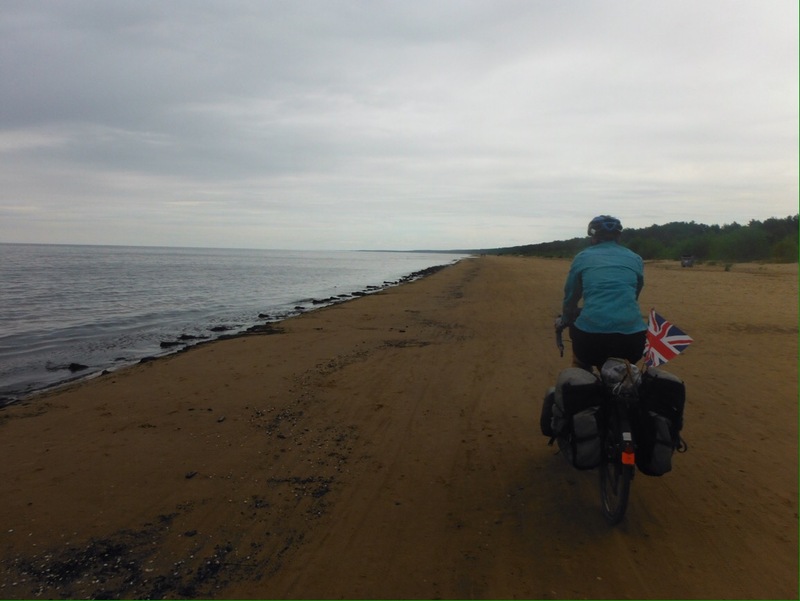 After a night camping by the sea we turned inland and with the help of an amazing tailwind that we savoured every minute of – as most of this leg will be riding west into the wind – we were in Riga two days later. Latvia was flat, green, and mostly well kept. Towns had attractive parks, old wooden buildings, castles and were very pleasant indeed. There was the odd soviet style concrete tower block but not as many as we had expected. It was a rainy morning’s ride to Riga, and included a comedy moment of hiding in a bus shelter when the rain was particularly fierce only to be completely soaked by a truck riding through a huge puddle/lake that had formed next to the kerb. By the time we arrived in the picturesque capital the sun was shining again. 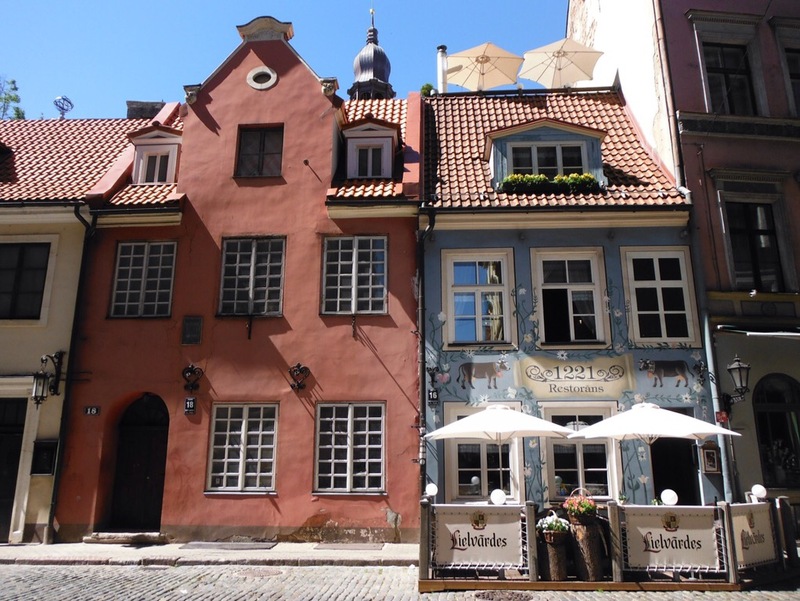 Riga is mostly known these days as a stag party destination thanks to Ryanair and cheap beer, but the old style buildings are ornate and the different pastel colours makes the whole place very easy on the eye. I say old style because most of the city was destroyed during WW2 and has since been rebuilt to look old. It’s actually pretty compact, we had a day to walk around but found that we had covered most of the old town in a few hours. 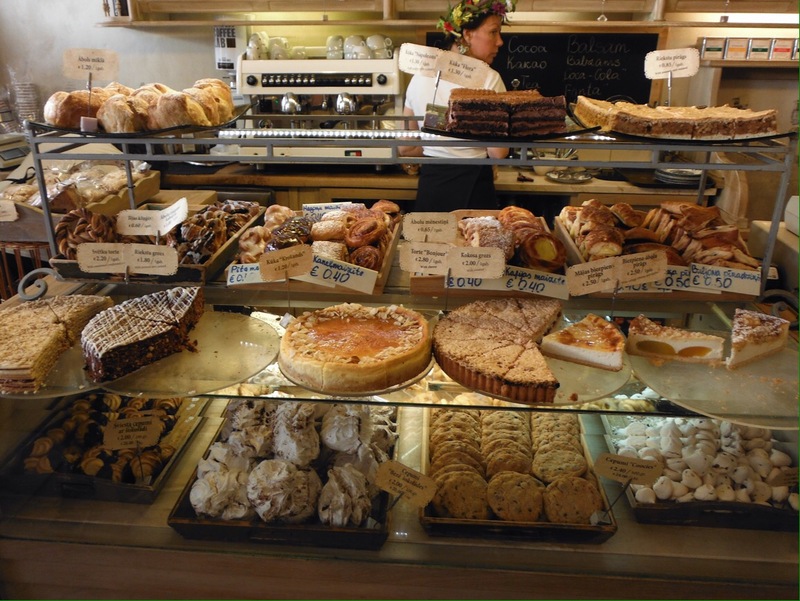 Including sampling a couple of bakery treats. Luckily we had arrived on party weekend. Midsummer, or ligo (pronounced leegwa, strangely) in Latvia, is celebrated on 23rd June and is said to be bigger than Christmas. Though most people celebrate by heading out into the countryside, lighting fires and drinking all night, there was a music festival in the city which had a nice atmosphere, even if it was like being in the middle of the Eurovision Song Contest. Latvian pop music is not to our taste. People were drinking and dancing, we saw at least three people fall over they were so drunk, and at one point there was a circle of women close to us who were all at least six feet tall. Apparently Latvian women are the tallest in the world, and on that evidence, I wouldn’t argue against it. An annoying-to-navigate ride out of Riga (as most cities are) had us riding up the coast towards Estonia. Our mistrust of the Eurovelo bike route deepened as the bike signs seemed to direct us into the sea – it actually went along the beach for 6kms. The sand was mostly hard packed but the bikes are so heavy it was tough going. Once off the beach the rain returned and we hung out at our usual bus shelter, watching as youngsters stumbled past drinking and singing, the beach party clearly rained off but not their enthusiasm. It was still the holiday weekend and we pulled in to a campsite that evening to find groups of Latvians keeping the fires burning and the alcohol flowing. One guy could speak fairly good English so spoke to us at length about immigration policies (“your mayor, she doesn’t want Eastern Europeans in the country but she lets all the Muslims in”; “do you see any brown people in Latvia? No, we kill them”) before rejoining the party. We fell asleep to the soothing sound of more Latvian tunes, hoping that when we crossed the border into Estonia the next morning the music as well as the weather would improve. I’m not sure I can ever watch Eurovision again. Latvia had been a nice return to the cycling lifestyle. Flat, easy camping, cheap food, tailwinds. It was good to be back on the bikes again, although I found the first few days quite tough mentally. I had optimistically assumed that normal life would fall back into place as soon as we were cycling again, but in reality everything had changed and it was hard to focus on what we were doing rather than what we would have been doing if we hadn’t had to return home from China. Cycling also gives you a lot of time to think – I had spent most of my time at home busy and suddenly my mind was empty and I thought a lot about my dad and what had happened over the past two months. Even though I often felt sad, I knew it was the right thing to be back cycling and finishing the trip off in the best way we could. Thanks to: Svenja, David and Zane.